Or maybe a place for pals, if that’s more to your liking. I sure do love Wegmans. I think I visited my first one, when it opened up in Hunt Valley, MD about 10 years ago. Originating nearly 100 years ago from Rochester, New York, they are growing in popularity and locations. If you’ve been inside, you know it’s like the Disney World of food stores. But, It’s more than just that. It’s a place of joy, inspiration, and happiness. And of course it’s a place where plenty of wonderful things can be purchased. Let me not get too carried away here. The heck with it, let’s have fun. It’s time to evoke emotions. Anything you want to go, is here; from sandwiches, sushi, salad, soup and of course the hot bar with international foods from all over this wonderful planet. But this is a pizza blog. Time to make moves. I must say, I love their cheese, white, and pepperoni pizza. Perhaps in the future I will review those. I will just say they are great. And there will be more posts regarding Wegmans pies soon. The specific store I visited for this installment was at Boulevard At Box Hill in Abingdon, MD. Slice #1 : The Bacon Cheese Blue Cheeseburger (pictured at the top of this post, on the left) : Oh my goodness. This was heavenly. I find their pizza dough to be exquisite. It’s cooked in their ovens to perfection. It wasn’t too crunchy nor too soft either. It tasted like I was eating a naan or pita bread. And that’s how their dough has resonated with me. And the mozzarella and blue cheese melted together, with the bacon and hamburger meat is an incredible combination. Phenomenal stuff. 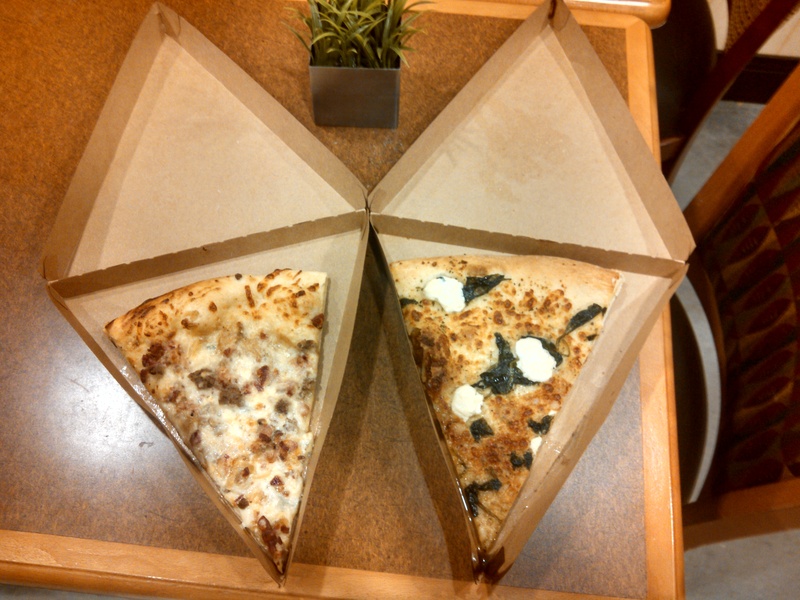 Slice #2 : The Spinach Ricotta (pictured on the right) : Well something went wrong here. I could tell it was siting on the tray for a while, as it was starting to look a bit old. The pizza tasted great, but the crust was too crunchy. The ingredients were great but needn’t have been out this long. I won’t fault the store, but I will fault time. It just felt like eating potato chips. But this will not discourage me from coming back. In my opinion, they have some underrated pizza. Maybe because it’s a grocery store and not a specific place to get an amazing slice or pie. I will be returning and hope to bring another inspirational take on the Wegmans experience. And with more pictures. « Matthew’s – Making Moves? I’ve never had Wegman’s pizza, but I will be sure to try it now! Can’t wait to try the Bacon Cheese Blue Cheeseburger!